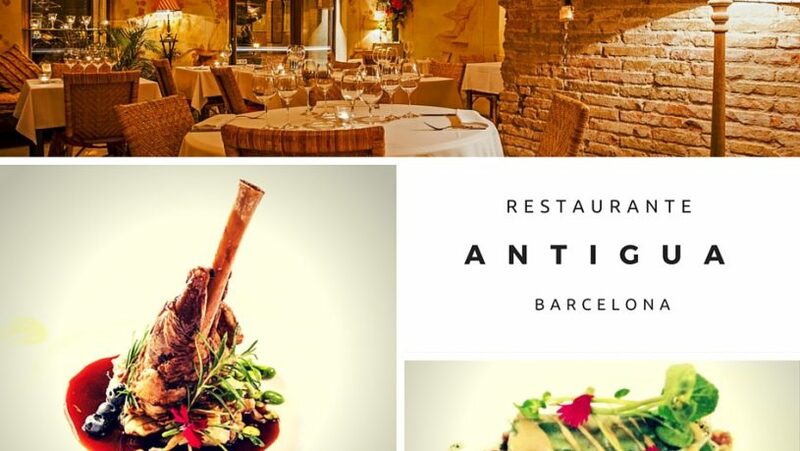 Located in the pleasant Barrio of Sant Gervasi, Restaurant Antigua Barcelona serves up creative and tasty dishes in a gorgeously evocative setting. Where would you take a special someone for a meal in Barcelona? If you’re looking for an intimate, romantic setting, Restaurant Antigua would have to be right up there with the best. Like many of the most atmospheric restaurants, Antigua hides its charms behind a rather unexciting exterior. The magic only begins as visitors step across the threshold. Chandeliers, ceiling mouldings, candles within niches, frescos, and extravagant vases of flowers are cleverly combined to create an elegant and beautifully detailed interior. With candles providing much of the evening lighting, and the rich ochre hues of the exposed brickwork, even the large central dining area retains a real warmth. The late opening hours – meals are served from 9pm – only reinforce this ambiance. However, if you insist on talking over sales projections whilst you eat at the Antigua – well, there’s nothing to stop you! Though we’ve raved about the Antigua’s atmosphere, the large room in particular is perfectly suitable for business meals. For mains, again there is beautiful seafood on offer, including soy and ginger marinated Mediterranean tuna with sesame seeds (€20.80). Affirmed carnivores can tuck into confit suckling pig with rosemary, or an Angus steak burger (sans bun), with brie, caramelized walnuts and onion confit. The dessert menu features such delights as berry strudels with apple and goat’s cheese ice cream (€7.00) and gin & tonic sorbets (€5.80). TripAdvisor reviewers – always a good source for tell-it-like-it-is critiques – were generally fulsome in their praise of the menu. A December 2015 review calls it, “…amazing, combining flavors, textures and presentation into authentic works of art.” Specific dishes attracting praise included the pear and gorgonzola salad starter, duck cannelloni main course and French toast with vanilla ice cream dessert. Reviewers, from food bloggers to members of TripAdvisor, are pretty much united on the quality of Antigua’s menu. However, visitors are much more divided on whether the prices represent good value. At the time of writing, starters range between 11 and 17 euros, mains from 20 to 23 euros, and desserts from 5 to 10 euros. Some considered this on the pricey side, and maybe that’s influenced by context: Barcelona is overflowing with reasonably-priced restaurants. It’s worth noting that some substantial discounts are available that can really trim the excess off your bill. Reservations and deals from The Fork and TripAdvisor (and their Spanish language eltenedor.es site), can knock a hefty 30-40% off the total. Our own view is that even on its own, the Antigua’s food is by no means overpriced. When you factor in the attentive service and beautiful surroundings, 50 euros a head (plus drinks) looks entirely reasonable for a special night out.